The Casamance is unique in Senegal for its greenness. While most of the country lies within the arid Sahel region, the Casamance represents the end of the desert and beginning of the rainforest. Getting there requires a 9-hour sept-place ride around or through The Gambia or an overnight ferry ride down the coast. Needless to say, we went for the ferry. 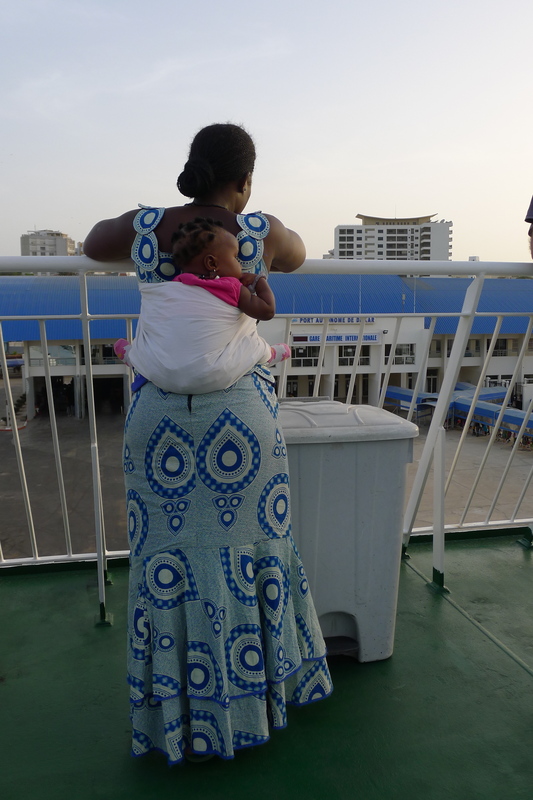 My favorite moments on the ferry came during our ride back up to Dakar. Walking onto the back deck of the ferry, I decided on taking one of the only shady seats in the place. A 20’ by 30’ awning stretched out over the bar and 2 double-sided benches. From here I had the perfect viewing spot over the Ziguinchor port. I watched as goats roamed the pier, as ferry goers who had just passed through 6 armed check points to board the ship passed by a simple wire fence draped with laundry and offering a gaping hole out into the parking lot, and as the green cargo boat moored in front of us off loaded a free standing bath tub. As the ferry began to fill, the bar under the awning became the place to be. Music played at such a level that ordering a soda resembled an interaction one might have at large nightclub in New York or London. Rain began to fall and the 300 people on the ferry rushed into the small space taking the only cover provided that wasn’t an interior cabin. The sound of the engines floated up adding to the excitement, and suddenly we were off. 300 people, one German ferry boat, and no goats (that I saw at least!) 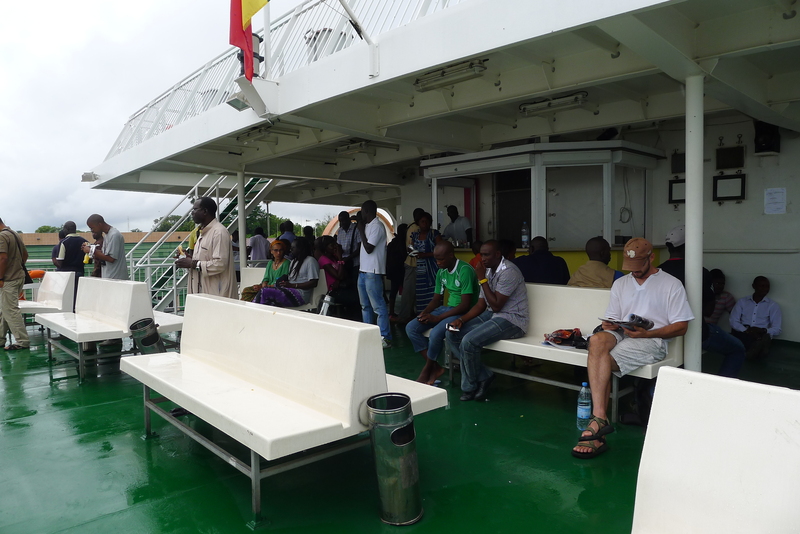 cruising away from the Casamance. Still like the hat! Good protection from sun AND rain.